In this Photoshop tutorial, we'll learn how to bring out hidden detail in the shadows and highlights of an image using Photoshop's aptly named Shadow/Highlight adjustment. First introduced in Photoshop CS, the Shadow/Highlight command quickly became a favorite with photographers and photo retouchers for its amazing ability to bring out details in the shadow and highlight areas of an image that were simply too dark or too light to see. In fact, the Shadow/Highlight command proved to be so good at bringing out image detail, many Photoshop users began applying it to all of their images, even ones that at first glance didn't seem to need it. The only real problem with the Shadow/Highlight command was that its default settings often made images look worse, not better, causing many people unsure of how the adjustment worked to quickly cancel out of it, never to return again. Also by default, the Shadow/Highlight command gives us only two basic controls, much like the Brightness/Contrast adjustment we looked at previously. The real power of the Shadow/Highlight command is found in its advanced options which we'll be covering in this tutorial. We'll also look at how to save more useful default settings to give you a better starting point when applying the Shadow/Highlight command to future images. I'll be using Photoshop CS4 for this tutorial, but older versions as far back as Photoshop CS will work just fine. A duck enjoying a swim. Unfortunately, the duck caught me by surprise and not wanting to miss the shot, I quickly aimed the camera and snapped the photo in a panic, forgetting to use a fill flash. The result was an image made up mainly of dark shadows and bright highlights with not much in between. Let's see if we can bring out more detail in the image, easing up a bit on the contrast and reducing its harsh appearance, using the Shadow/Highlight command. Before we begin, it's important to keep in mind that as powerful as Photoshop is, it can't restore detail that simply isn't there. If the shadow areas in your image are so dark they've become pure black, or if your highlight areas are so bright they've become pure white, there won't be any detail to restore. If there is detail though, the Shadow/Highlight command can work wonders. The copy of the Background layer, named "Layer 1", appears above the original in the Layers palette. Go to Image > Adjustments > Shadow/Highlight. The default appearance of the Shadow/Highlight dialog box. A Shadows value of 50% is usually too much to start with and can result in images looking washed out or, in some cases, even give them a strange, otherworldly appearance, which is why some people quickly cancel out of the command and shrug it off as useless. That's unfortunate since Shadow/Highlight can be incredibly useful if we make a simple change to the default settings, which is what we're going to do. We're going to set both the Shadows and Highlights options to a starting value of 0% and save them as the defaults so that the next time we go to apply the Shadow/Highlight command on an image, it will have no effect at all until we make our own adjustments. Lower the Shadow amount to 0% by dragging the Amount slider to the left. Select "Show More Options" to view additional options in the dialog box. Click on the "Save As Defaults" button to save the new settings as the defaults. The next time we open the Shadow/Highlight command, the dialog box will appear in this expanded view (which is what we want) and both the Shadows and Highlights values will be set to a starting value of 0%. Now that we've taken care of the default settings, let's look at how to actually use the Shadow/Highlight command. The expanded version of the Shadow/Highlight dialog box may appear a little intimidating at first, especially since the simplified version of the dialog box contained only two sliders. If you look closely though, you'll see that it's divided into three sections, and two of the three sections are exactly the same. At the top is the Shadows section containing three sliders to help us bring out shadow detail in the image. Directly below it is the Highlights section which contains the exact same three sliders. These sliders allow us to bring out detail in the highlights and they function exactly the same as the sliders in the Shadows section, so once you understand how the Shadows section works, you'll already know how the Highlights section works! Below the Highlights section is the Adjustments section which contains a few additional options for adjusting the image. We'll look at the Adjustments sections a bit later. First, let's look at the three sliders that make up the Shadows section. Watch your image as you drag the Amount slider to decide how much brightening you need to apply to the shadows. Detail is now visible in the darker areas of the image after increasing the Amount value. The Tonal Width slider in the Shadows section determines the range of brightness values that will be affected. The Radius value determines how the adjusted areas of the image will blend in with the unadjusted areas. You may need to change the Amount and Tonal Width settings once you've adjusted the Radius value. The Shadow/Highlight command made it easy to bring out hidden detail in the shadows. We'll look at how to bring out detail in the highlights, as well as some additional options, next! Many people use the Shadow/Highlight adjustment in Photoshop simply to bring out detail in the shadows, leaving the highlights alone. There's certainly nothing wrong with that, especially since our eyes are not nearly as good at distinguishing highlight detail as they are with shadow detail, so the Shadow/Highlight command seems to get most of its "wow factor" from the shadows. However, the Highlights section of the Shadow/Highlight dialog box, which you'll find directly below the Shadows section, is designed specifically to bring out any hidden details in the highlights of an image, and the best part is, you already know how to use it! The Highlights section contains the exact same three sliders - Amount, Tonal Width and Radius - that we just looked at in the Shadows section, and they work exactly the same way. The Amount slider determines the amount of darkening you want to apply to the highlights. The further you drag the Amount slider towards the right, the more highlight detail you'll bring out. The Tonal Width slider determines the range of tonal values that will be affected. The only difference here is that it sets the range for the highlights, not the shadows. At its lowest setting, only the brightest areas of the image will be affected by the adjustment. As you drag the Tonal Width slider towards the right, you'll expand the tonal range to include more of the midtones. 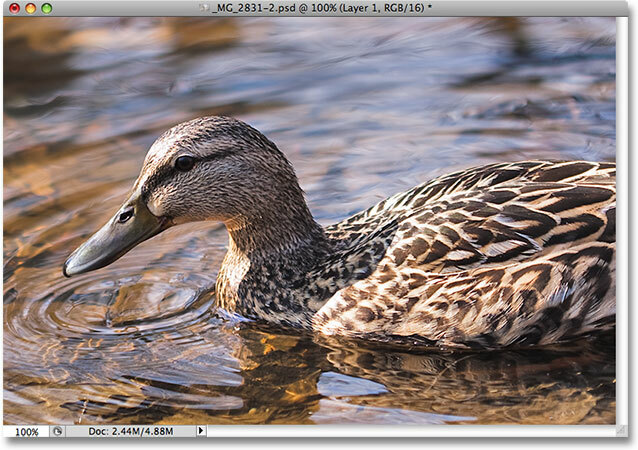 The Radius slider determines how the adjusted highlight areas will blend in with the rest of the image. Just as with the Radius slider in the Shadows section, setting the Radius value too low will cause the image to look flat. Again, there are no specific values to use for these options since the correct settings will depend entirely on the image you're working on, so keep an eye on your image in the document window as you move the sliders. The Highlights section includes the same three sliders found in the Shadows section. Here, they're used for bringing out highlight detail. Minor changes with the Highlights sliders can help reduce the impact of overly bright areas in an image and bring out subtle highlight detail. The Adjustments sliders can be used to correct any color saturation or contrast problems. And there we have it! That's how to bring out shadow and highlight detail an image with the Shadows/Highlights tool in Photoshop! Check out our Photo Retouching section for more Photoshop image editing tutorials!